Eric Pickles is clearly not ashamed to be a Conservative. 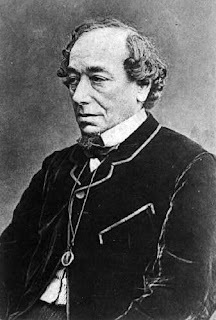 In defending the public role of Christianity generally, and of the Church of England in particular, the Secretary of State for Communities and Local Government is upholding democratic Conservatism as it developed in the 19th Century under the leadership of Benjamin Disraeli. Christians continue to be positively involved in public life, from the role of Anglican bishops in scrutinising legislation in the House of Lords, through the moral leadership offered by Christian leaders, to the contribution of thousands of churches and Christian charities to the social fabric of our neighbourhoods with their volunteering and sacrifice. Religion is the foundation of the modern British nation: the Reformation is entwined with British political liberty and freedoms, the King James Bible is embedded in our language and literature, and the popular celebrations of the Royal Wedding and Diamond Jubilee placed the Church side by side with our constitutional monarchy. Disraeli may seem an odd figure to invoke in an argument about Conservatism and Christianity. He pursued a dissolute, Byronic youth and had a tendency to mendacity in his political life. It would be foolish to present him as a proto Ann Widdecombe. But he would have been appalled at the fact that the Strictly Come Dancing star has not been elevated to the House of Lords because she has been too vociferous in upholding historic Christianity and opposing political correctness. Disraeli was assiduous in promoting the influence of the Church of the nation. He passionately believed that a strong national Church was an essential safeguard against governmental tyranny. One of his last acts as Prime Minister was to appoint the evangelical JC Ryle to be bishop in the then new See of Liverpool in 1880. Though he could be accused of some political manoevering in that appointment, Disraeli knew full well that Ryle would pro-actively proclaim Jesus Christ across Merseyside and appoint frontline clergy who would do the same. Disraeli's famous 1864 saying about Darwin's theory of evolution - "Is man an ape or an angel? I, my lord, am on the side of the angels" - was not a scientific statement; it was a witty denunciation of the spiritual and moral aridity of atheism. Significantly in the light of the contemporary debate, the mature Disraeli honoured the God-created institution of heterosexual marriage. In relation to the Seventh Commandment ("Thou shalt not commit adultery"), he was conspicuously unlike William Gladstone who sailed very close to the wind in that department. With the modern party membership falling and political indifferentism prevailing amongst young people, Disraeli, if he were here now, would be thoroughly supportive of Mr Pickles's inspiring reminder of the spiritual and moral roots of Conservatism. He would agree that Conservatives who harbour a 'whatever' attitude towards Christianity in our public life are not only ducking a vital issue for our identity and cohesion as a country; they are betraying themselves. Julian Mann is vicar of the Parish Church of the Ascension, Oughtibridge in South Yorkshire.